Audiotape of forger's 1981 con game "was a fun discovery," says one collector. 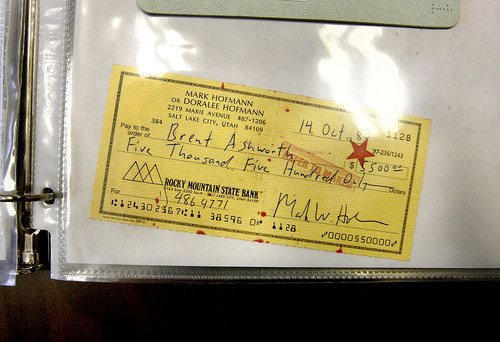 Scott Sommerdorf | The Salt Lake Tribune A check made out to collector Brent Ashworth by Mark Hofmann dated October 14, 1985. 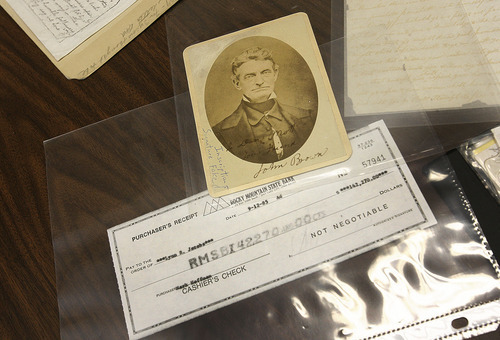 Scott Sommerdorf | The Salt Lake Tribune From Brent Ashworth's collection of Hofmann memorabilia, a faked inscription on a photo of abolitionist John Brown and a Hofmann cashier's check made out in the sum of $142,270. Scott Sommerdorf | The Salt Lake Tribune A Hofmann forgery of a letter purportedly written by Lucy Mack Smith. 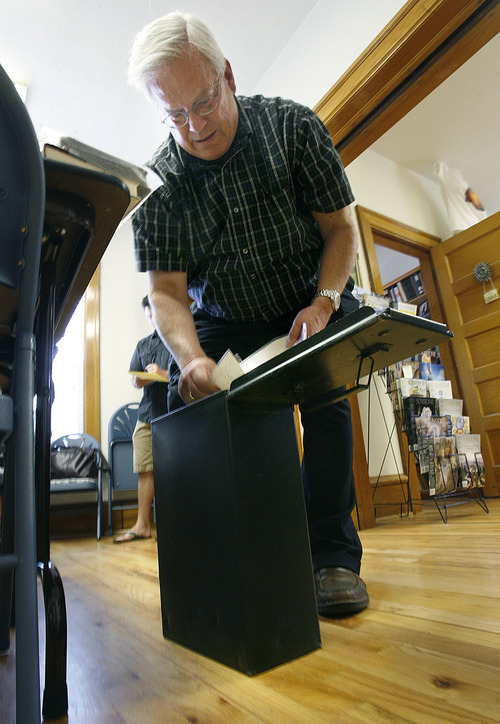 Scott Sommerdorf | The Salt Lake Tribune Collector Brent Ashworth removes Hofmann documents from an ammo case at the Sunstone offices in Salt Lake City on Thursday. 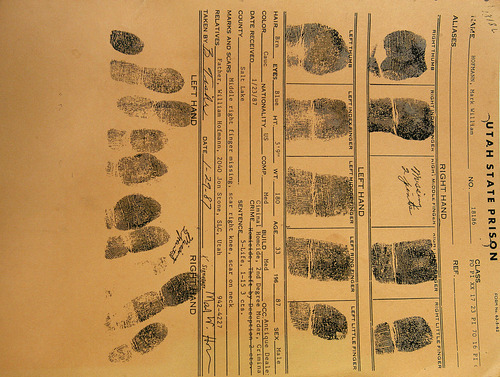 Scott Sommerdorf | The Salt Lake Tribune A detail of a Hofmann forgery of a letter he asserted was written by Lucy Mack Smith, the mother of LDS founder Joseph Smith Jr. Scott Sommerdorf | The Salt Lake Tribune The booking fingerprints belonging to Mark Hofmann. Note the middle finger on his right hand had been blown off, so there was no fingerprint. 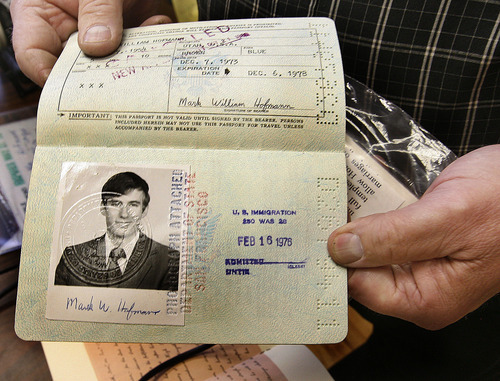 Scott Sommerdorf | The Salt Lake Tribune Mark Hofmann's passport held by collector Brent Ashworth. 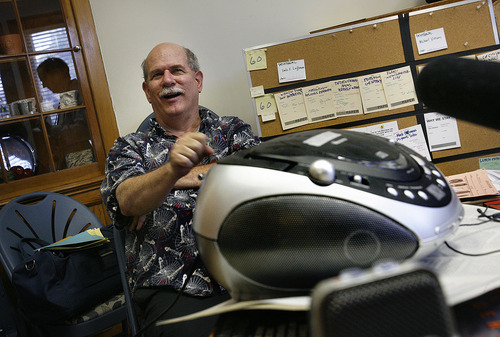 Steven L. Mayfield, a crime lab technician with the Salt Lake City police, spoke to the press about a newly discovered tape phone conversations by Mark Hofmann as he attempted to sell his forgeries in the early 1980s. The tapes were played at the Sunstone offices in Salt Lake City on Thursday. Scott Sommerdorf | The Salt Lake Tribune Steve Mayfield listens as the tape of Mark Hofmann's phone conversations is played. Scott Sommerdorf | The Salt Lake Tribune Collectors Brent Ashworth, left, and Steven L. Mayfield, discuss the Mark Hofmann recordings. 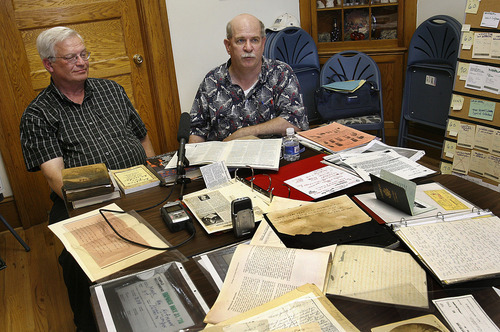 Collectors have discovered a tape, clandestinely recorded by infamous bomber and Mormon forger Mark Hofmann, that chronicles his 1981 attempt to scam the Reorganized LDS Church, now the Community of Christ, out of an original copy of the Book of Commandments. 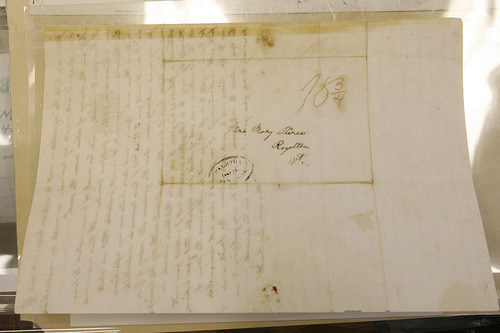 On the recording, Hofmann offers to trade what he calls an "original copy" of the Joseph Smith III blessing, a document formally appointing Joseph Smith III as successor of church leader Joseph Smith Jr.
"You mean one of the first printings?" asks Madeline Brunson, secretary for the then-RLDS Church. "Oh my. How can I reach you?" In a soft, sometimes lilting voice, Hofmann goes on to say the document was reportedly "priceless" and that he had received other offers. He says he acquired the Jan. 17, 1844, blessing amid a stack of documents purchased from an amateur LDS history collector in Coalville. "I thought you'd be interested in at least hearing it," he says before reading verbatim what turned out to be his own prose. "Oh, I am," Brunson responds. "I'm supposing you want remuneration for that." Hofmann later offers to fly to the Missouri-based church to make the trade. "It was a fun discovery," retired prosecutor and Hofmann collector Brent Ashworth said about the recording, a segment of which was played for reporters Friday at the Sunstone offices near downtown Salt Lake City. "I don't know where I got it from exactly. I don't know if the people I got it from knew what it was either." Mixing inks to match the period, Hofmann made millions of dollars selling documents that bore the signatures of more than 80 famous figures. The list includes Butch Cassidy, Abraham Lincoln, George Washington, Emily Dickinson, John Milton and Mark Twain. The bulk of his scams  and ill-gotten cash  focused on the early history of the LDS Church, however. Hofmann was convicted in 1987 of two separate pipe-bombing deaths to cover up his forgeries. He has never talked from prison about his motives for targeting the LDS Church. Steve Mayfield, a collector and veteran crime-scene investigator for the Salt Lake City Police Department, plans to play an hour-long audio recording of Hofmann's dealings on Aug. 4 at the Sunstone Symposium at Weber State University. The tape is the only known recording chronicling Hofmann's attempt to sell a forgery for an original church document. The recording was turned over to the LDS Church in 2007 by Ashworth, a history buff who owns Hofmann's high school yearbooks, missionary diaries and the suit he wore to prison. But although he delivered the unlabeled cassette to Mormon archivists, "I don't think they listened to it." Indeed, Mayfield says LDS Church Historian Richard Turley drew a blank when reminded recently about the tape. "We have what?" Mayfield recalled Turley saying. "The reason I'm playing it is so people can actually hear history," Mayfield said. "I compare it with hearing Richard Nixon from the tapings in his office. It has a different feeling than just reading a transcript." The recording also includes a conversation between Grant McMurray, who would go on to be president of the Community of Christ, and Hofmann. On the tape, McMurray sets up a March 1981 meeting in Salt Lake City to negotiate with Hofmann about a possible trade. Mayfield and Ashworth note the deal never happened. Instead, Hofmann traded the bogus blessing to the LDS Church, which, in turn, traded it to the RLDS Church for a duplicate of the Book of Commandments. 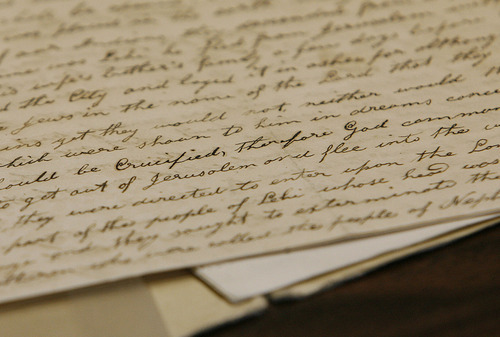 Once the blessing was determined to be a forgery, however, the collectors say the LDS Church returned the Book of Commandments. Three years before Hofmann's pipe bombings made headlines and rocked the Mormon community, church insiders had suspicions about the swindler. Mayfield notes that in May 1982, the Mormon History Association held its annual conference at Weber State College. During those meetings, the deceitful dealings memorialized on the phone recording were discussed. "Even back in '82 we knew this guy wasn't upfront about the way he double-dealed," Mayfield said. And when he heard the now-30-year-old tape: "I call it throwing out his fishing line and reeling these people in." Ashworth didn't actually hear the tape until two years after he turned it into church historians. The church gave him a copy of the CD, but he didn't listen to it until 2009. "I thought, 'Wow, this has got to be unique,'" the collector recalled about Hofmann's attempt to rip off the then-RLDS Church. "If that's not the definition of chutzpah, I don't know what is." But why would he risk creating criminal evidence by taping himself in the act? "Ego," smiles Ashworth, who also has a theory about motive for Hofmann's forgeries: Payback to the LDS Church for excommunicating Hofmann's grandfather.